Christine Hager-Braun was born in Wasserburg am Inn in Germany. She was raised in a rural area and graduated high school as one of 37 students. Mrs. Hager-Braun attended the University of Regensburg, Germany and received a M.S. in Biology (1994) and then a Ph.D. in Biochemistry (1997). In 1999, she and her husband moved to North Carolina, USA, to continue their research interests. To balance her work as a scientist and raising a young child Mrs. Hager-Braun started art quilting. She was fascinated by the idea to create “paintings” out of fabric and thread. Although mainly self-taught Mrs. Hager-Braun made a bold decision in 2006: she resigned from her work as scientist and focused on a career as professional fiber artist. Mrs. Hager-Braun creates art quilts which are exhibited in regional, national and international exhibitions. She won awards in a variety of exhibitions, she is the two-time recipient of the Grant for Emerging Artist presented by the Durham Arts Council (Durham, NC) and she was selected by the Rosen Group as a 2016 Niche Award Finalist. Her work can be found in national and international private collections. She also created several art quilts for two very large hospitals in Rochester, MN. In addition to creating art, Mrs. Hager-Braun is actively involved in arts organizations. She was the President of the Professional Art Quilters Alliance – South (PAQA-South) and also served as its Vice President and as board member. From 2014 to 2017 Mrs. Hager-Braun coordinated the efforts of the Studio Art Quilt Association (SAQA) to translate the organization’s calls for artists into several different languages. In her current art work, Mrs. Hager-Braun focuses on the power of art in the context of health. 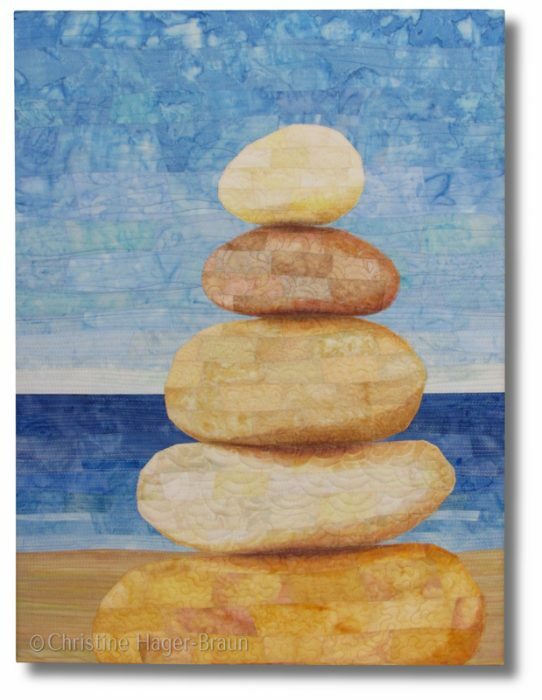 Her art quilts about mental health issues intend to start a conversation among viewers. Her abstract landscapes aim to create a visual place for the viewer to rest, relax and reflect on life. The ultimate goal for Mrs. Hager-Braun is to break down barriers, integrate opposing sides and emphasize interaction, healing and inner peace through her art.